Arguably the most beautiful of Tovste’s buildings, the Greek Catholic church is impressive from whatever angle one views it. Conceived around 1911 to replace a wooden church dating from 1730, its construction spanned more than three decades. This is confirmed by the Greek Catholic schematism for 1912, which reports that the existing church had been demolished and that the construction of a new one was about to begin. Click to view a photo gallery for more images of the interior and exterior architecture of the church. 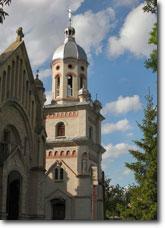 The church was designed in Ukrainian baroque style by the architect Jan Zubrzycki – a native son of Tluste. The priest at the time, Teodozij Kurpiak, paid for the plans to be drawn up, and the first stone was laid by Vasyl Badlyuk. As the architectural drawing (at right) reveals, Zubrzycki’s original design was more ornate than the construction that was ultimately realised. The church has a very deep foundation. When it was excavated, bones were uncovered, presumably from the cemetery of another even older church that had once stood in its place. The skeletons of the individuals uncovered, said to have been very tall, were reburied in the cemetery (Pawlyk, pers. comm.). Construction had to be stopped during the difficult years of the First World War and in the postwar period, and was resumed only in the mid-1920s. As can be seen in this photo, dated 1927, the construction had reached only about 10 m by that time and was nowhere near to being finished. Apparently, the reasons for the slow progress concerned more than just lack of funds for construction. The townspeople objected to the fact that it was destined to become an orthodox church, preferring instead that it be Greek Catholic. Their will ultimately prevailed. Since the old wooden church had already been demolished to make way for the new construction, for more than a decade people had to attend services in a provisional wooden chapel, also mentioned in the Greek Catholic schematism for 1912. It was so small that the parishioners overflowed into the churchyard even during the wintertime. Anton Navolskyy arrived in Tluste around 1930 to succeed Teodozij Kurpiak as priest, and he undertook to realise the completion of the church. After the death of Jan Zubrzycki in 1935, Mr. Stanislavskyy supervised the construction. Minutes from the Greek Catholic church, kept from 1913 to 1946 -- now on file at the museum -- record details of the building process, including payments for basic materials. One can observe, for example, that the town’s dealer in construction materials, Hersch Spitzer, donated wood free of charge; and that parishioners paid for other materials and services through a barter system (for example, eggs in exchange for certain work). The exterior was mostly complete by around 1939 but the interior, including the cupola, was still not yet decorated. It was said that the authorities in Ternopil refused permission to decorate the church. Presumably this was linked to the lingering dispute over its denomination. The head of the local administration, Vasyl Tracz, went ahead regardless and the interior work was finished around 1942 – but not before Tracz was reprimanded for his actions. Work was still underway to put the finishing touches on the church when the Germans invaded the region in July 1941. That month, a huge explosion of an arms-laden transport train at the station of Tluste damaged the metal frame windows of the newly completed church, but otherwise it remained structurally intact. This would not be the only threat to its existence, however. As Pawlyk reports in the History of Tovste, following the death of Andriy Sheptytskyy, Archbishop of the Ukrainian Greek Catholic church, on 1 November 1944, the KGB with the consent of Stalin began to liquidate the Greek Catholic church in Ukraine. Many Catholic priests were arrested and imprisoned, and were sent to concentration camps in Siberia. According to the resolutions of party bodies in Lviv on 8-10 March 1946, decisions of the Union of Brest were cancelled and the Greek Catholic Church became subordinate to the Russian Orthodox Church. The Greek Catholic church of Tovste continued to function secretly through underground activities. 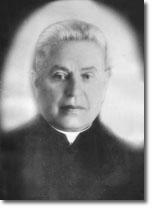 Priest Anton Navolskyy was allowed to conduct mass for some time, but in the 1950s he was relieved of his duties. 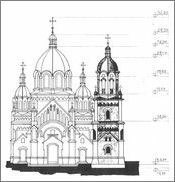 As shown in this architectural sketch from 1994, the height of the church to the top of the cupola is about 28.5m, and the entire structure, including the cross, stands 32.7m high. A modern belltower (pictured below) was built near the church that year to replace a temporary wooden structure. The new tower, constructed of plain grey brick, houses a single, large bell procured around 1990. The original bells for the church were hidden during the Second World War, to keep them from being looted by the Nazis. They were thought to have been hidden somewhere on the church grounds, but the persons who hid them since died. The secret of the bells’ location went with them to their grave, and they were never found. Final note: At the time of writing, in Spring 2006, artisans from Lviv had almost completed an extensive redecoration of the interior artwork, a project lasting more than two years. The result of their meticulous and skillful artistry - especially visible in the cupola - is breathtaking.. While the interior of the church has now been completely restored to its former glory – and perhaps surpassing it – there is reason for concern about the integrity of the exterior of the century-old structure. Portions of the massive stonework are decaying and resources are not available for undertaking proper repairs. Instead, the defects have been plastered over with makeshift cement patches. Funding is required for the exterior restoration work that needs to be done by skilled artisans in stone masonry. If you would like to contribute to the further restoration of the church, please use the Feedback page to indicate your potential support.